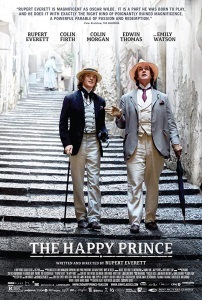 I was lucky enough to see a screening of this on my birthday with writer/director/star Rupert Everett in person. The film focuses on Wilde's life in exile on the continent after his release from prison, though there are a few flashbacks to his earlier life. The film has beautiful cinematography. Surprisingly, almost none of it was shot in France -- Brussels stood in for Paris, with some covering with fog and snow, and many of the interiors were shot in Germany. There are some great lines, some of them almost thrown away. For instance, when Lord Alfred Douglas is talking about the death of his father, he mentions that his father spat in his brother's face (something which apparently actually happened.) Robbie Ross deadpans "Queensberry rules," in reference to the late Marquess' rules for boxing, which would of course forbid spitting, marking the Marquess as a hypocrite. As was mentioned in the Q&A, the film is somewhat of a love letter to Robbie Ross, who, while not the most famous lover of Oscar Wilde that Lord Alfred Douglas was, was much more dependable. In the Q&A Everett compared this to how one is younger, one may be more attracted to wild affairs but over time one seeks more steady companionship. Everett has acted in film adaptations of Wilde's plays, including being in The Importance of Being Earnest with Colin Firth, who is in this film as well. and Everett has played Wilde in David Hare's play The Judas Kiss. If not an Oscar, Everett should at least get a Bafta for this. I've added 2005's Separate Lies to my to-watch list since it includes Everett, Emily Watson (who plays Oscar's wife Constance) and Tom Wilkinson (who makes a cameo in this film.) Everett mentioned that he was working on this script after shooting that movie and thought of the two of them. I've seen the movie twice. It's such a well known tragic tale. The highest highs and the lowest lows. And good for Rupert Everett to give Robbie Ross his due.